Shorty battery strap for the Xray XB4 2015. Also available with custom engraving as pictured by ordering BBR0046. 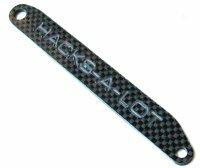 Made from 2.5mm gloss finish carbon fibre, this strap is a direct replacement for the original shorty battery strap. Made from high strength 2.5mm carbon fibre.